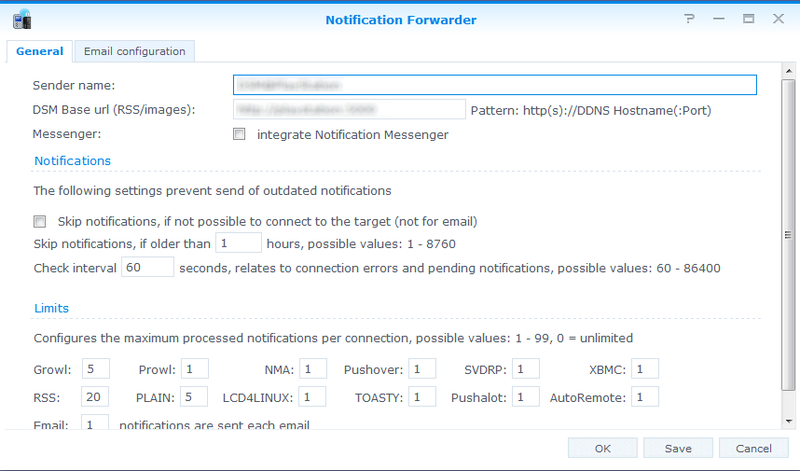 Notification Forwarder is able to forward DSM notifications through various protocols to smartphones or pc. The following protocols are available: AutoRemote, Email, Growl (UDP/GNTP), LCD4Linux, NMA, PLAIN, Prowl, Pushalot, Pushbullet, Pushover, RSS, SVDRP, TOASTY and XBMC. 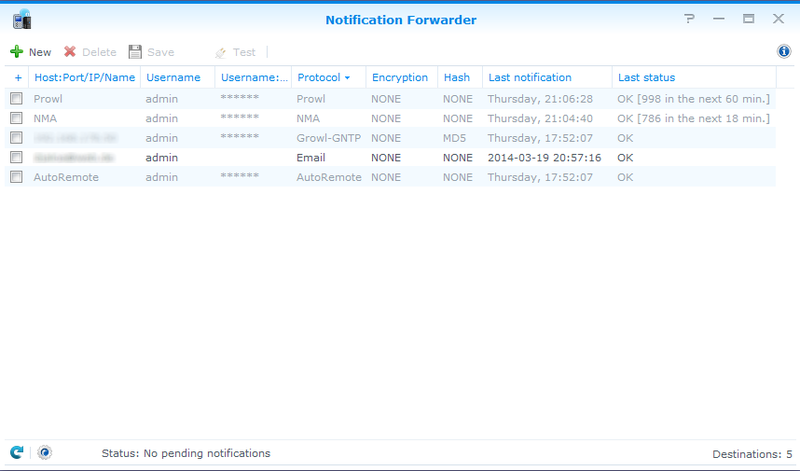 - changed behaviour of daemon, it now runs constantly and checked at a selectable interval for new alerts. This was necessary because Synology prevents the execution of scripts within /usr/syno/bin and calling external scripts outside of /usr/syno/bin in DSM 6.0. - Would you use Gmail as email provider, then please use the predefined entry "Gmail" in Control Panel - Notification - Service providers and perform the OAuth login by clicking on "Log in to Gmail". Subsequently please use only the method "DSM Configuration" in the Notification Messenger. - added protocol field 'X-Sender' to protocol 'Growl-GNTP', this allows in conjunction with Growler >= 0.7-060 that the destination determine which user has send the notification. - added option 'DSM Base url' to options form, this allow the display of notification icons outside your local network. It act now also as base url for RSS. - net_notifier.js: fixed test mode always responds success, even if not all fields filled. @Ed pls update to perl 5.18.1-0010, this fixes the issue. Can't locate common/sense.pm in @INC (you may need to install the common::sense module) (@INC contains: /usr/lib/perl5/site_perl /usr/share/perl5/site_perl /usr/lib/perl5/vendor_perl /usr/share/perl5/vendor_perl /usr/lib/perl5/core_perl /usr/share/perl5/core_perl .) at /usr/lib/perl5/vendor_perl/JSON/XS.pm line 104. BEGIN failed--compilation aborted at /usr/lib/perl5/vendor_perl/JSON/XS.pm line 104. Compilation failed in require at /usr/syno/synoman/webman/3rdparty/net_notifier/index.cgi line 18. BEGIN failed--compilation aborted at /usr/syno/synoman/webman/3rdparty/net_notifier/index.cgi line 18. Check out whether the field "user:password" have spaces before or accidentally slipped behind the contained value. The API token and the user/group-key must be entered together in the field separated by a ':'. You will see the API token in the dashboard after logging in pushover.net, the user-key when you click on the app you created. I'm trying to send a message to pushover, but I get "application token is invalid"
My user key seems ok, is your app correctly registred with pushover ? How about adding MQTT to the supported protocols? It would help us integrate DSM notification with anything.